Jack Nicholls is joined by former Renault driver Jolyon Palmer to discuss a sensational victory by Red Bull's Daniel Ricciardo, as chaos ensued in final 20 laps. 5 live's Formula 1 Commentator Jack Nicholls is joined by former Renault driver Jolyon Palmer to discuss a sensational victory by Red Bull's Daniel Ricciardo, as chaos ensued in final 20 laps. Mercedes’ Lewis Hamilton finished a frustrated fifth, while championship leader Vettel could only finish eighth following heavy contact with Max Verstappen. 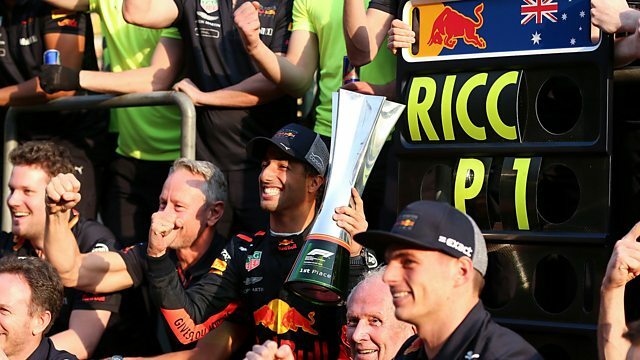 We hear from the victorious Daniel Ricciardo, along with top-five finishers Valtteri Bottas, Kimi Raikkonen, Lewis Hamilton, Max Verstappen, plus championship leader Sebastian Vettel.